The Eroli Museum of Narni is one of the most important museum systems in the province of Terni: named to Giovanni Eroli (1813-1904), historian, archaeologist and antiquarian native of Narni, the Museum houses important works of art andantique collections. 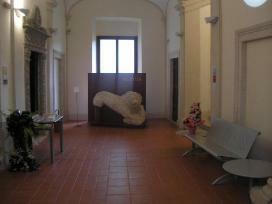 The Museum is located in Palazzo Eroli and is split over three floors occupying an area of approximately 900 sq.m. On the ground floor of the building houses the town library with more than seventeen thousand volumes, most of which areprinted between 1600 and 1800 , a precious collection of Dante with almost one thousand eight hundred pamphlets and books from the private collection of Giovanni Eroli. On the first floor there are prehistoric, a section devoted to the Classical Age, apre-classical and medieval. Among the most important works exhibited there isan Egyptian mummy with its sarcophagus. Upstairs there is the gallery with the center one of the most important works of the museum, the Coronation of the Virgin of Domenico Bigordi, said Ghirlandaio, towhom is reserved an entire hall. In addition to the works of Ghirlandaio is possible to admire the work of Piermatteo of Amelia, of Spagna, the Vecchietta, AntoniazzoRomano, Livio Agresti. Fridays, Saturdays, Sundays, holidays and public holidays 10:30 to 13:00 / 15:00 to 5:30 p.m.
Closed on 25/12. The only 1.1 hours in the afternoon.